Meat & Livestock Australia (MLA) has launched its new Lamb campaign, taking a light-hearted approach to Australia’s rivalry with New Zealand and encouraging both nations to unite and “Share the Lamb”. 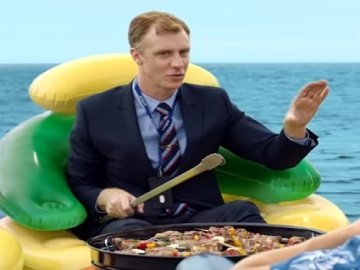 The 30-second version of the spot, from creative agency The Monkeys, opens with an inflatable barbecue with sizzling lamb cutlets floating in the ocean, “precisely halfway between Australia and New Zealand,” and continues with two pairs of people – two young men from New Zealand and a man and a woman in formal attire from Australia – meeting there and having a conversation while sitting on inflatable chairs. “That is the smell of unity, my antipodean friends,” the Australian man, who seems a government official, tells the two Kiwis, proposing then they unite to create “New Australia”. Told that “name’s a bit stink,” the man’s colleague comes up with the idea of calling the new territory “New Australia-land.” “But best of all, you get to share our Prime Lamb,” the woman’s colleague adds, hoping this will convince them. “And we can share your Prime Minister,” the other Australian official says. “I guess we better with Jacinda first,” one of the two Kiwis answers. When a woman sitting on an inflatable chair nearby shouts to the guy, asking him to invite Jacinda to the party, as well, all the people there – it turns out there are thousands of them – start cheering. The commercial, which is actually 2-minute long, ends with the onscreen line “Share the Lamb. 100% Australian”.